Never charge again with our all-electric elite two ac! Simply plug the power cord into an outlet for endless hours of play! 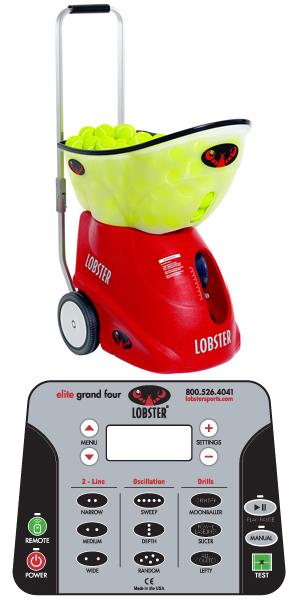 Plus, since there is no internal battery adding weight, the ball machine is 8 pounds lighter and easier to move around on the court and off. 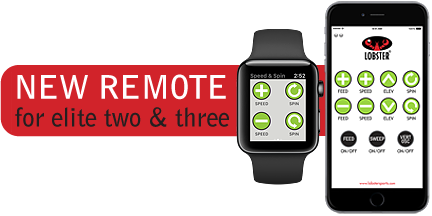 Want even more power options? 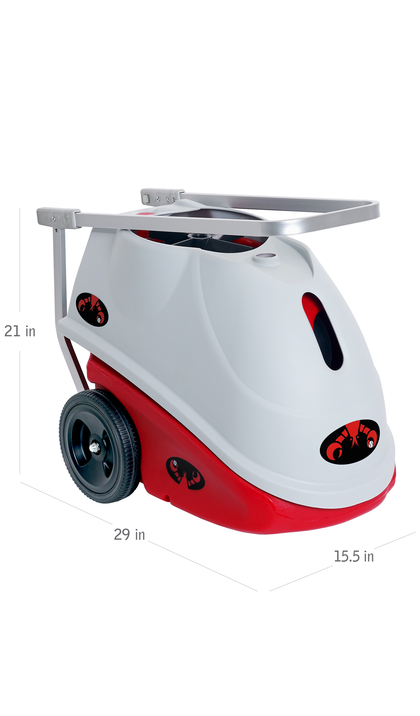 Our newest model, the elite two ac/dc uses both electricity and battery, offering ultimate power versatility with the ability to use your machine on a court with or without a power outlet. 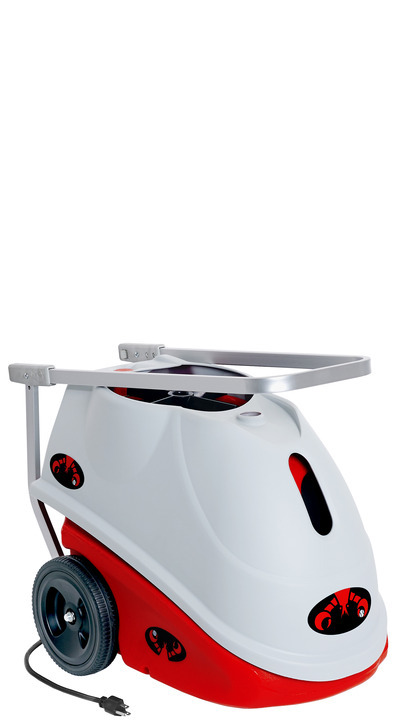 Additionally, the ac/dc power allows you to use the machine while you charge — just like your laptop — so you are never left waiting for your machine to power up! 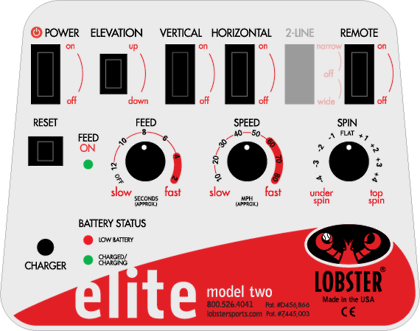 Equipped with all of the elite one features, both the elite two ac and elite two ac/dc add in advanced triple oscillation which takes match play to the next level. While most ball machines sweep randomly left to right horizontally, the Lobster elite two electric ball machines also oscillate vertically, giving you short and deep shots in a random pattern to provide a better physical workout. 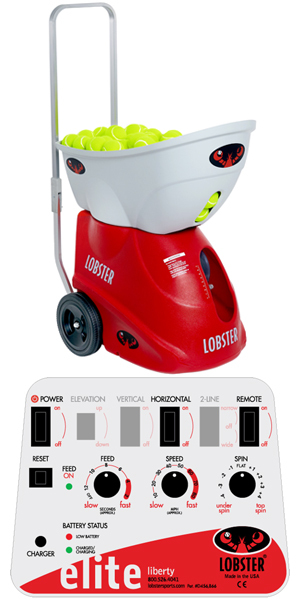 This Lobster ball machine will challenge all of your strokes, not just your forehand and backhand. Triple oscillation simulates match play by combining both vertical and horizontal oscillation functions to throw balls throughout the entire court-left, right, short, and deep. Sky-high lobs and blistering speeds of 80 mph will take your game to new levels, improving your reaction time while you advance your foot speed agility. The unlimited repetition of hitting hundred or thousand of balls will improve any level player's game. If you want even more oscillation features of a narrow and wide two-line drill, find out more about our premium elite three ac & ac/dc machines.